All of these forks and spoons arrived with damage by the garbage disposal and knife marks on the backs of the fork tines. All of this flatware was repaired removing the damage while keeping the soft hand-hammered finish. Fork tines often wear unevenly. The tips get bent and the outer tines are shorter than the two inside tines. For these forks the ends of the tines were filed even, reshaped and given new points. Then the forks were polished. The customer said, "I received the package with the forks. They are beautiful! Thank you for your great work." 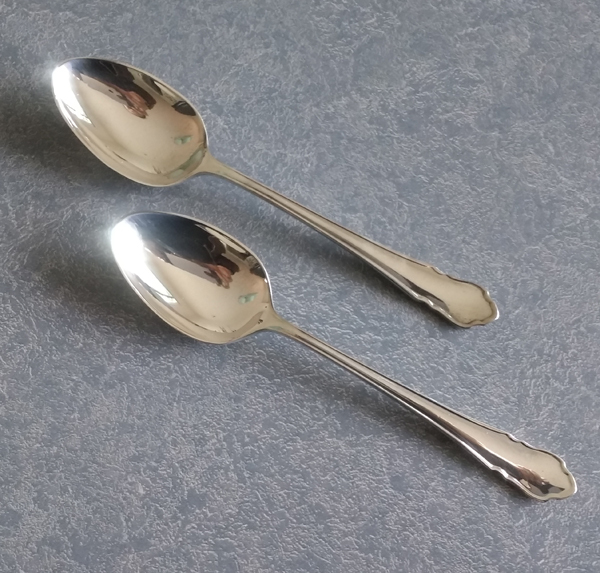 This spoon went through the garbage disposal misshaping the spoon bowl and leaving damage to both the bowl and handle pattern of this Five O'clock teaspoon Frontenac by International Silver. After reshaping the bowl, I do the best I can to remove the gouges from the garbage disposal with great care to preserve the handle decorative motif. The most difficult aspect of garbage disposal damage on spoons is reshaping the bowl. Bowl shapes do differ slightly for each pattern, plus I am trying to reshape the bowl and save as much of the silver teaspoon bowl as possible. Most likely after the repair the bowl will be slightly smaller depending on how chewed up the edge was before I started. Sent an extra spoon if you want me to try to match the bowl shape, otherwise, I will make my best guess. This sterling silver baby fork was badly damaged from the garbage disposal. It really bent the fork tines and chewed up the fork and handle. The goal is to straighten the tines and remove as much of the chew marks as possible. I worked around the original engraving to preserve this family heirloom. 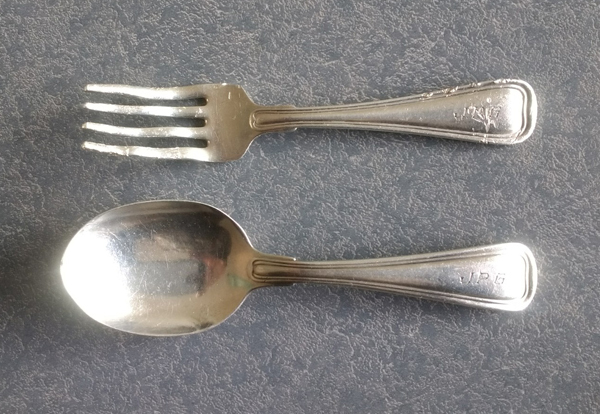 Both the baby fork and spoon were polished so they matched for future generations. This sterling silver baby spoon was very badly damaged from the garbage disposal. It had extensive chew marks and the spoon bowl was dented and misshapen. I was able to reshape the spoon bowl, but in this case the handle pattern was so badly damaged that a lot of the pattern detail was lost. Most important is the sentimental value. This sterling silver baby spoon handle was misshapen and the bowl of the spoon was bent. The customer said she stepped on the spoon. It was also very discolored from tarnish. The handle had a faint engraved monogram which I worked very hard to preserve. The sterling silver baby spoon in the images above arrived broken in two pieces. I soldered the baby spoon back together adding a patch on the back to strengthen the repair. Spoons always break at the same place, right where the handle attaches to the bowl, as you can see in these photos. Soldering a broken handle on a spoon are always one of the most challenging repairs. After the baby spoon was silver soldered it had to be completely refinished and polished to remove fire scale. The sterling baby fork was polished to match. Knives in sterling silver handles are traditional set in the handle with pitch. This way the knife blade can be repaired or replaced. Below are a number of different examples of knife repairs and restoration. Scroll down or CLICK HERE to view more examples of new stainless steel knife blades in sterling silver handles. This child's knife with sterling silver handle was a family heirloom but the knife was rusty and looked terrible. In the (top) photo you can see the original knife blade in the sterling handle with the replacement knife above. 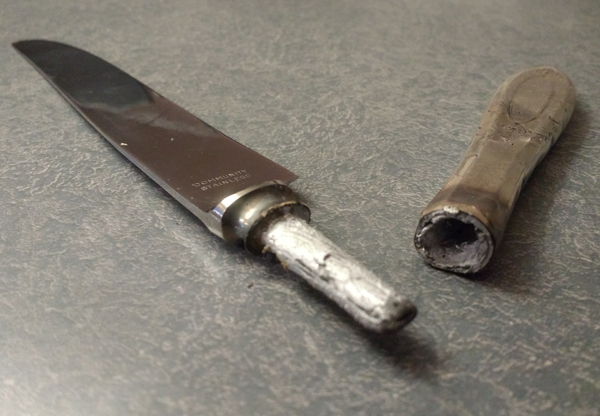 The rusty steel knife blade was replaced with stainless steel. The restored knife is shown in the bottom of the photo. The selection of new stainless steel knife blades is limited. Occasionally, the knife blade comes out of the sterling handle. The original stainless steel knife can be reset into the handle using pitch - the traditional material. The joint between the knife and sterling handle will be soldered for a seamless joint. All of these knives (left photo) arrived with the knife blades pushed out of the handle. This is most often caused by putting your sterling handled knives in the dishwasher or soaking your knives in very hot water for an extended period of time. Never put sterling silver handled knives in the dishwasher. To be repaired the knife blade must be removed from the handle and all the pitch removed from the handle to start fresh. The handles are refilled with pitch. I do solder the juncture of the knife blade to the handle for a more attractive finished look. Then the sterling silver handles are polished. CLICK HERE to view more examples of new stainless steel knife blades in sterling silver handles. These antique Christofle knives arrived rusty and discolored. Removing the knife blades and putting in new stainless steel blades was an option, but then the original Christofle mark on the blades would have been lost. Instead I polished the steel knife blades and the silver handles. When these steel blades are used they need to be washed and dried immediately. Careful and immediate application of Lip Balm will prevent rust. These sterling silver knife handles arrived with the seams on the side split. Soldering split and cracked seams on sterling silver handles is complicated by the fact that dirty split seams do not like to solder. After removing all the pitch on the inside, I cut down the seam for a clean fresh straight line into thicker metal, insert a shim of sterling silver sheet, and solder this shim in place. The repaired seam is nearly invisible, and much stronger. These repairs are not inexpensive. The seam on these sterling silver knife handles were split on both sides of the handle. This is a common scenario but double the work. After all the soldering and refinishing of the handle is the second repair - reinserting the knife into the handle. Replacement of the knife would be less expensive, but you can not replace the sentimental value that these knives have been used for generations of family dinners. 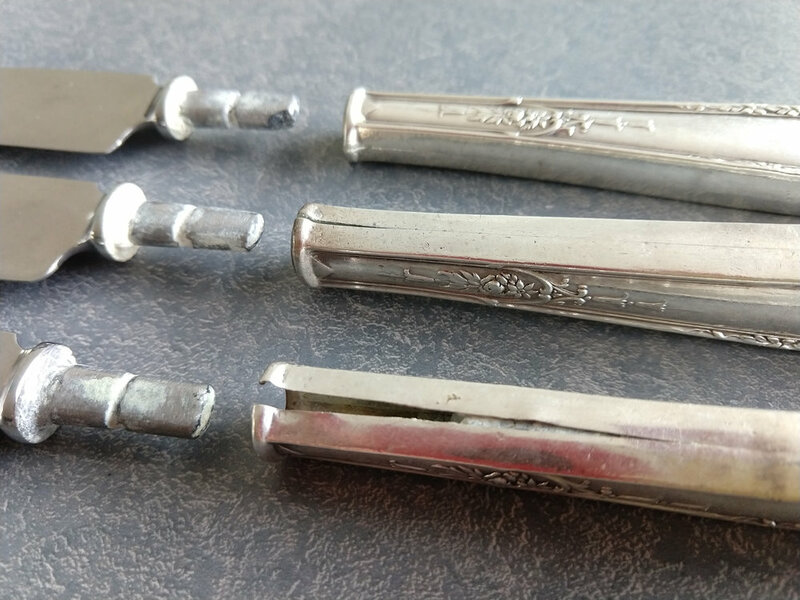 For these antique carving forks, the clip-like fixture on the back was removed as requested by the customer. This modification made these carving forks more usable and more modern in appearance. The original steel carving fork was polished to remove rust and pitting. Extra care was taken to protect the mother of pearl handle (top) and celluloid plastic handle (bottom). Both of the carving forks are steel and arrived very corroded. The steel was polished best possible* to restore their appearance. The carving knives were professionally sharpened. The sterling handles were polished. *The steel was very deeply pitted. While I can polish the steel, the deep pits from rust and corrosion were not removed because I would have had to grind away too much of the steel. Steel knives and forks can be maintained by washing immediately after use, and wiping with Burt's Lip Balm every time before storage. This carving set arrived with the steel forks, knives and sharpener all badly rusted (left photo.) The smaller carving fork and knife also needed to be reset into the handle. An option to keep the character and style of the original knives is to polish the steel knife, steel carvng fork, steel sharpener and the sterling silver handle. It was all a marathon effort and extremely hard to do. The steel does not polish easily because the metal is very hard. The pits from the extensive rust can not be completely removed, but the knives are irreplacable and worth keeping if you don't mind imperfection. These 19th century Irish spoons arrived with the bowls bent and misshapen. Old silver is often very thin. I think it is a combination of 150 years of wear combined with the fact that the silver was thinner than modern silver. The bowls often bend at the same place - the widest part of the bowl. I reshaped the spoon bowls and tried to gently work harden the silver at this crucial area, but extra care should be taken when using old silver. 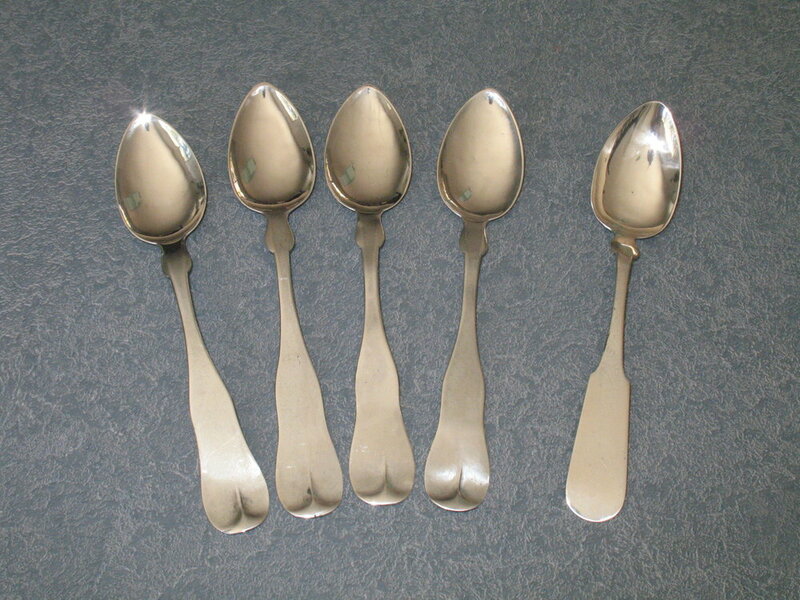 This photo shows five coin silver spoons circa 1820. 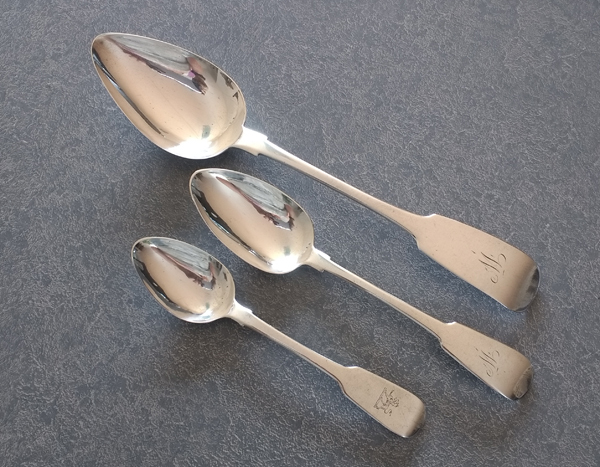 These silver spoons were severely dented, dinged, and misshapen from years of use and neglect. The right spoon was actually cracked and bent. These old silver spoons are always very thin and inherently fragile. They were carefully restored by reshaping the spoon bowls, soldered as necessary to repair the cracks and polished. While I would not normally polish 200 year old silver this shiny, it was necessary because of the severe damage and extensive repair work. This sterling silver fork was broken. To repair this properly, a patch is put on the back of the fork to strengthen the repair. This is extra work and costs more but it is worth the investment, otherwise the repair is too weak. It would be a false economy to repair this without a sterling silver patch. It is less expensive to replace the fork rather than repair it, but not all flatware is replaceable. There is also no replacing sentimental value of using a work that has been at family meals for generations. Extensive damage to sterling silver jelly spoon bowl was repaired. Unfortunately, the sterling silver butter knife was broken in two pieces. The butter knife was soldered back together adding an attractive patch on the back for additional reinforcement and then polished. This sterling silver spoon is a family heirloom that arrived broken in two parts. Spoons usually break right where the handle tapers and attaches to the bowl. It was soldered back together with a sterling silver patch on the back to reinforce and strengthen the repair. The patch is attractive, and I was careful not to cover the hallmark on the back. The customer wanted to restore a rare silverplate cheese scoop, but the handle was badly damaged. To restore this rare serving piece I took off the handle from a knife in the same pattern. Then the cheese scoop was reset into the silverplate handle. This type of repair is not to save money. The purpose was to complete a set for a hard to find pattern.